Truly Polished: My first franken - Kind of! My first franken - Kind of! Hope you've had a lovely day! I've been so busy rushing about that I've been too busy to eat! So I've ordered a pizza and thought I'd write a post while I'm waiting for it. Today I'm wearing a franken topcoat that I made. I am IN LOVE with this, it's probably the 5th time I've worn it in the 3 weeks since I made it, and that speaks volumes from me. I get bored very easily but this topcoat can really add a special something to a tired looking nail polish. This is the second franken I've made. The first one will be swatched soon I promise but this topcoat was more appropriate for today. I was feeling a black polish, and I've been wearing so many flakies recently that I thought I'd layer my franken over it for a change. The topcoat is a bottle of clear nail polish (I bought 10 from Fragrance Direct online for 99p each!) with some holographic pigment put in as well. Please note this is NOT Spectraflair! This is called Imitation Spectraflair, and retails for about £7 rather than around £15 for the actual Spectraflair. I will be buying some of the good stuff soon, but I have ordered the Speciallita HITS No Olimpo Hefesto topcoat from Llarowe, so I don't NEED to franken any for the time being. This is a scattered holographic top coat, rather than the blindingly rainbow linear effect. The look I was going for was A England Bridal Veil. You can find about a million swatches online! 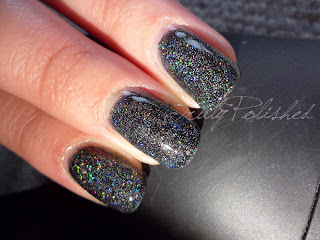 I love both types of holo finish, but I think scattered holos look so classy! All of the photos below have 2 coats of Rimmel Black Out with two coats of my franken, topped with one coat of Seche Vite. I've called this "Star Nursery" because that's exactly what happens... Stars are born on your nails! The sun refused to come out to play when I was taking the photos, typical British weather!!! These photos really don't do the polish any justice, maybe I'll add a few more if the sun comes out one day! I really want to try this over a hot pink, something like Cult Nails Devious Nature when I finally buy it! On that note, time for me to eat enough food for at least three people! I absolute;y love your franken. I was lucky enough to purchase some spectraflair a couple months ago. I can't see myself using all of it up. Another swap maybe??? lol That stuff's so expensive You did such a great job. I didn't even know there was a such thing as "imitation spectra flair" lol. Thanks for sharing & enjoy your food. Glad you like it, I'm so in love with this polish, luckily I have loads more pigment and clear polish for when this one runs out! Custom Creation Paints in the UK sell it, they do the real stuff too. As for the swap, we'll have to see if I've got anything swap-worthy in the future!